Optimara Violets are now available in a variety of decorative, self-watering containers. All Optimara Self-Watering Ceramics are elegantly sculpted from heavy-cast porcelain and glazed to produce an attractive finish that is also very durable. Designs include many eye-catching patterns, both traditional and contemporary, and they are available to fit all of Optimara's standard 4-inch, compact, miniature and super miniature varieties. As an added value, Optimara Self-Watering Ceramics are as practical as they are decorative. As their name suggests, these ceramic containers are self-watering. They employ Optimara's patented wicklock system to draw the proper amount of water from the container into the soil. It's the same self-watering feature that has made the Optimara MiniWell and MaxiWell so popular with growers of African Violets. 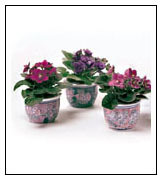 Optimara Self-Watering Ceramics are available in an array of colors and patterns. Styles include the Optimara "Love Seat," a ceramic container which hold two flowering African Violets. In addition, Optimara Self-Watering Ceramics are available in a number of holiday styles, especially designed for Christmas, Valentines, Easter, Mother's Day and other special occasions. As holiday gifts, flowering party favors or accents at dinner settings, Optimara Self-Watering Ceramics offer more than just another pretty vase. Because they are self-watering, they also make growing African Violets easy. And if they also look good doing it, then that's just one more reason why Optimara Violets are simply beautiful.